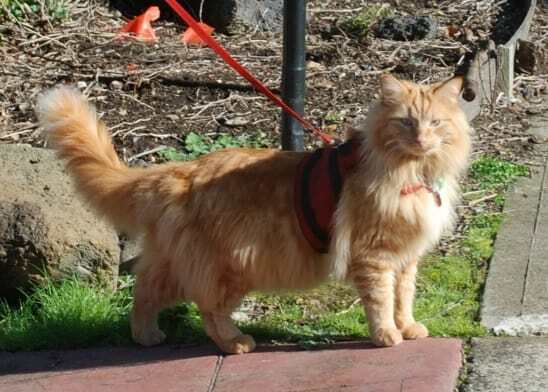 Yes, cats can walk on a harness and lead, just like dogs. Most cats are incredibly in tune with their body and will often collapse to the ground when you first put the harness on them. Watch one particularly dramatic cat. But they do get over this. The trick is patience and associating it with something good – like food. Don’t give up if they don’;t like it at first. When they learn that they get to go outside, most become quite happy wearing one. Their lives will be so much more interesting when they can spend some time outdoors, with you. 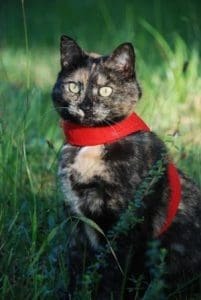 Before using a harness, make sure they’re comfortable wearing a collar. Leave the harness and lead lying around the house so they can smell it, get used to it being around and put their scent on it. Maybe put it on their favourite perching place so it becomes a non-threatening ‘thing’. Get treats ready. When they’re in a calm frame of mind, fit it to them. Breathe deeply while they accuse you of murdering them. Most cats will drop to the ground or fall onto their side, as if they’re paralysed. When they’ve settled down a little, offer their favourite treat or toy. That will take their mind off their ordeal. Keep doing this a few times over a period of days or weeks, depending on how your cat reacts. Get them to the stage where they’re comfortable walking and jumping normally around the house with their harness on. Attach the lead to their harness and dare to tell a cat they can’t do exactly what they want. Breathe deeply while you’re again accused of murder. Get them used to feeling pressure on the back of the harness as you gently restrain them when needed. This will be another new and strange sensation for them. When they’ve got used to being gently ‘restrained’ by the lead and not going wherever they want, venture outside to a quiet place, like your back yard where there are no overt threats, and at night when they’ll feel safer. Let them go where they want, within reason, so they can see how good this harness and lead thing is and the whole new world they get to explore. Make sure the harness is attached snuggly, otherwise they can ‘reverse’ out of it, especially if it’s a H-style harness. Take it at your cat’s own pace and do short outings. If there’s anything frightening going on, like a neighbor mowing the lawn or dogs barking, take them back inside so they don’t associate the harness and lead with something negative. 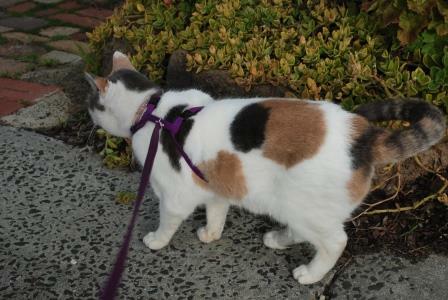 If you live in a cat-safe area, start taking them for walks in more open areas – your front yard, along the footpath etc. Smile when you see your cat getting important sensory stimulation, with the added benefit that you’re entertaining your neighbours. There are an increasing range of cat harnesses to choose from. These are the ones we’ve used. Our favourite ones are the hand-made ones from Mynwood. They are made to your cat’s exact size (and colour preferences!) and are more escape-proof than most. An Australian knock-off is available, but we haven’t tested it. The Mynwood ones are reversible, so you get two colours in one. 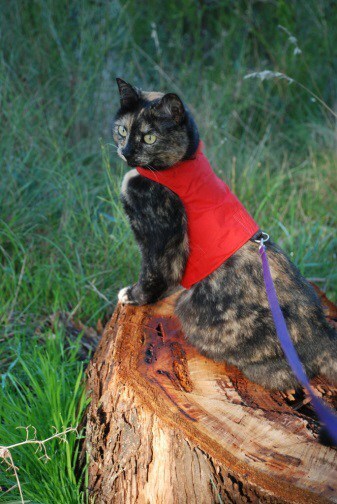 The Cat Walking Jacket made by MetPets has a neck strap and two body straps, and a solid piece of fabric, which may help a cat feel secure. We don’t feel the design is as escape-proof as the Mynwood jackets and have stopped using them. The ‘H-style’ harnesses from pet shops are OK, but it’s easier for a cat to reverse out of them if they aren’t done up snugly. They’re also probably less comfortable around a cat’s body. If you don’t keep up with your cat, the thin neck strap can cause them to choke. Instead of a lead, we use a long piece of thin rope, about 5m long. This gives them more freedom to explore and means you’re less likely to end up crawling through a blackberry bush. Doug Meyers takes his cat, Eduardo, to their destination in a backpack with a solid base, then asks him to walk back. Being keen to get home, he dawdles less. Eduardo even goes camping and directs them back to camp! We use a soft-sided carrier with a shoulder strap for the outward journey; our cat happily walks home quite quickly, with her Mynwood jacket attached to us by a long piece of rope. She can go back into the carrier if she’s tired or scared. 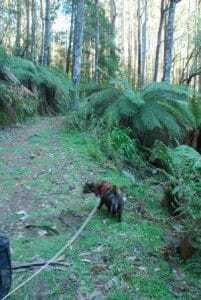 She has also gone bushwalking with our dog.